This website was started in May 1997 by members of Men’s Centre North Shore Inc. Following the foundation of the NZ Union of Fathers (uof.org.nz) in 2001, the committee decided to withdraw from political activism and concentrate on developing support services for separated fathers negotiating the Family Court. Menz.org.nz is now owned and administered by the current webslave John Potter. Contact details here. 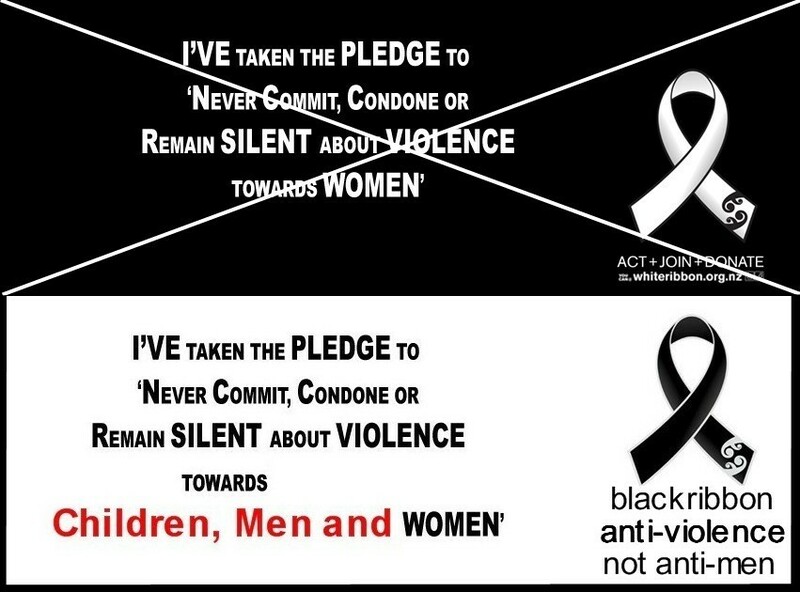 All articles on MENZ.org.nz are published by individual members, with no moderation by the administrator. This is an open forum – views expressed are the sole responsibility of the author, and in many cases DO NOT represent my personal opinion. If I am advised that any material has been published unlawfully or in breach of copyright, it will be removed as soon as possible. Since July 2004, all news items, articles and site updates are listed on the HOME / News page. Older items can be most easily found by using the search form on any page, by browsing the News Archive index, or the sitemap. In addition, the MENZ Issues archive contains a complete record of NZ’s first men’s newsletter, founded by Martin Lewis in November 1995. 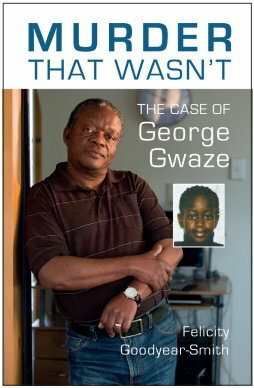 This site also archives all the COSA Newsletters from the organisation Casualties of Sexual Allegations edited by JohnP’s wife Dr Felicity Goodyear-Smith between 1994 and 1999, and COSA North News & Views edited by Gordon Waugh. There are a number of DIY advice kits for fathers separating from relationships, including information about representing yourself in the Family Court. There is an overview of gender politics, and pages on specific issues such as domestic violence, false sexual accusations, male health, boy’s education and the shared parenting campaign. Links to other sites are usually on pages related to specific topics, but other men’s and fathers’ groups are listed on the New Zealand links and the international links pages. 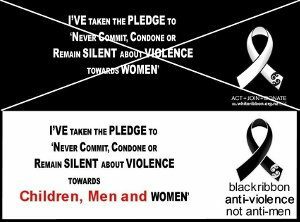 There are also a number of e-mail newsgroups which you can join to make contact with other men and women active in the movement. "Just as the last third of the twentieth century was about creating equal opportunity for women as workers, so the first third of the twenty-first century will be about creating equal opportunity for men as parents. Neither goal will be achieved until both goals are achieved." – Warren Farrell, author of ‘Father and Child Reunion’. The title ‘Masculinist Evolution in New Zealand’ was first used by Men’s Centre North Shore co-ordinator Martin Lewis in 1995 when he founded the MENZ Issues newsletter. As it didn’t mean a lot to me when I took over as editor at the end of 1997, it didn’t feature much until MCNS decided to relinquish ownership of this website in late 2001 and I suddenly needed a new title. Soon after making the change I thought it would be useful to add some information about what the term masculinist means, so I typed it into the Google search engine and found that the first site it recommended was the one you are currently looking at – mmmmm! 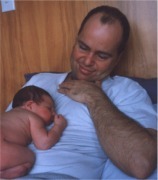 Photo: MENZ.org.nz webslave John Potter and daughter at 2 days old. My primary role in life is as a house-husband. My wife Dr Felicity Goodyear-Smith returned to her work as a university researcher when our daughter was six weeks old back in 1994, and since then I’ve been the main caregiver and housekeeper. I am very proud of the fact that Felicity never had to wash or fold a single nappy (although I did let her change a few!) When school started I began to work part-time designing websites (link), but that took second place behind school pick-ups, swimming lessons, drama classes, touch rugby, supermarket visits, and yes, cleaning toilets and mopping floors. It’s a great life! A large part of my motivation for developing this website is that I want to strongly encourage and support other men lucky enough to find themselves in a similar position. I was not completely unqualified for my job as primary caregiver. During my first marriage in the 1980s I tried to be a good provider, but after returning from a long international business trip to find that I had been replaced by another man, I realised that the traditional male role has some significant disadvantages. Fortunately, my ex-wife did not attempt to obstruct my access to our two young boys, and over the next 15 years I was able to care for them approximately half the time. My personal experience of shared parenting has convinced me that life is vastly better for children and parents alike compared to most of the other separated fathers I have met, where most of the power is in the hands of the mother. Again, this is a powerful motivating factor underpinning my support for the reform of our female-centred Family Court system.